After having Halloween last week and way more candy around than usual, we were ready for something healthy and light! This dinner fit the bill quite nicely. The flavors from the black bean salsa perfectly accompany the guacamole. 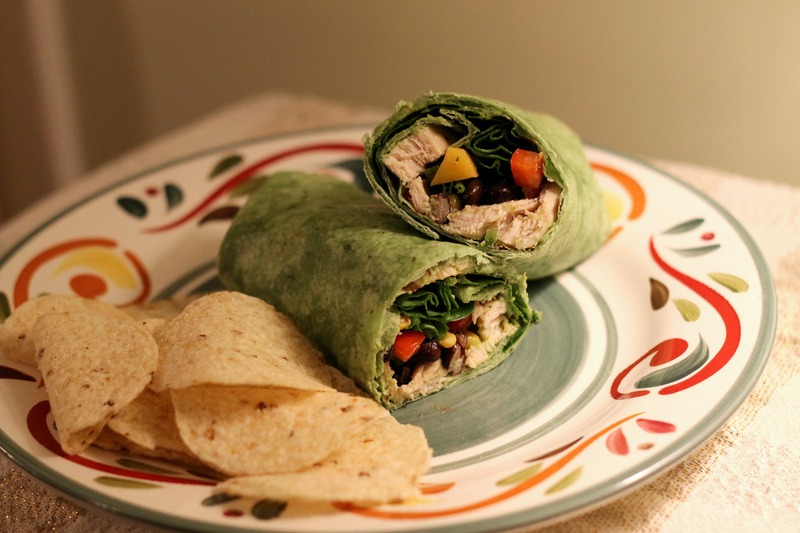 Bonus, they say the more colorful a meal is, the healthier, and this wrap has plenty of bright colors! We can see it as a nice lunch (not that it’s likely we will have time to make any of the components for these wraps on a school night, but whatever!) as well. Serve with a glass of lemonade and a couple of corn chips and salsa (not photographed) and you are set! We had some guacamole from Trader Joe’s in the fridge, so that’s what we used, but the recipe calls for homemade and that would probably make it even better, so if you have the time to make your own, do it! Either way, this is a delicious dinner. To make the guacamole, split the avocados, remove the pits, and scoop the flesh into a bowl. Mash with a fork until smooth. Add remaining ingredients and stir until well-mixed and fluffy. Refrigerate until serving. For the salsa, mix together all the ingredients in a bowl. Let refrigerate for an hour to allow the flavors to blend. To assemble, spread each wrap with 2 tbsp. of the guacamole. Place 1/4 cup of chicken and 3 tbsp. of the salsa on the bottom third of the wrap, and add a handful of the spinach leaves. Fold in sides and roll up the wrap. Slice in half and serve. Enjoy!